I updated the Google Idea of the Week, which is now Camilla Belle. She is a gorgeous actress who you are probably familiar with. She is in When A Stranger Calls and 1000 B.C. (one of my favorite movies.) You can check her out in the new movie Push, too. If you are a huge Twilight fan like me then you know that she is friends with Robert Pattinson aka Edward Cullen. So look to the right of the page, and Google her! And.. back to business. I am loving the Loreal Voluminous eyeliner right now. It is an eyeliner pen with a slanted tip. The tip allows you to choose the thickness of your liner, and it really makes your eyes pop! The eyeliner is relatively easy to apply, and it gives you a very dramatic, bold look. I used it in my Mardi Gras inspired look, which is my previous post. 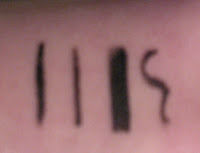 The eyeliner pen does not smudge because of how quick it dries. The price is around $10 and it is available at any drugstore. Check out the swatches I did (love the wavy one!) Also, if anyone has a request, comment, or suggestion please leave me a comment or email me!